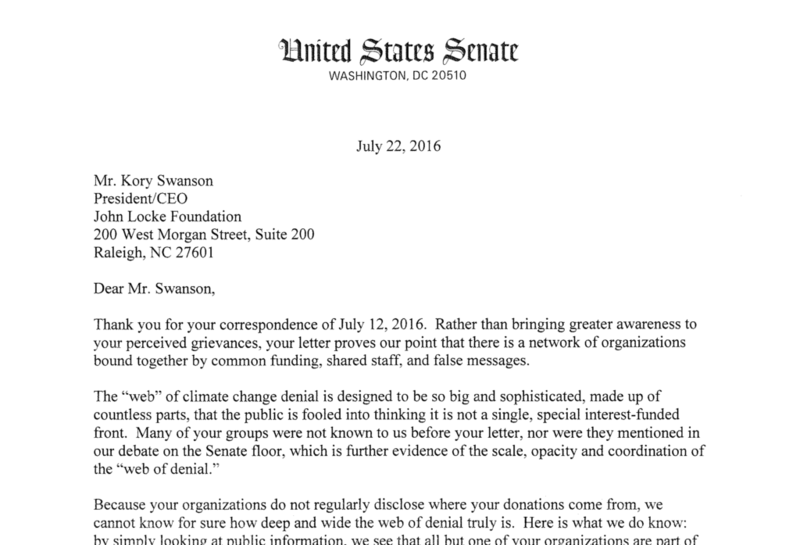 A letter dated July 22, sent by nine Democratic U.S. senators to John Locke Foundation President and CEO Kory Swanson and the heads of 21 other free-market public-policy organizations, restated accusations that the groups are part of a “web of denial” about the role of human activity in climate change and reiterated a demand for the organizations to disclose their donors. “We would like to know whom we are debating,” the letter said. As Carolina Journal reported earlier this month, legal scholars called the initial “web of denial” allegations, played out over two days on the floor of the Senate, an attempt to coerce JLF and the other organizations into complying with investigations by threatening to deploy laws meant to crack down on organized crime using tactics that the U.S. Supreme Court has ruled, in other circumstances, a violation of the First Amendment. The free-market groups jointly addressed Democratic senators in a letter dated July 12, saying the elected officials’ “enemies list” posed a clear threat. “There is a heavy and inconvenient cost to disagreeing with you. Calls for debate will be met with political retribution. That’s called tyranny. And we reject it,” the letter stated. The senators’ July 22 response was signed by Sens. Harry Reid (Nev.), Charles Schumer (N.Y), Sheldon Whitehouse (R.I.), Barbara Boxer (Calif.), Richard Durbin (Ill.), Bernie Sanders (Vt.), Al Franken (Minn.), Elizabeth Warren, and Edward Markey (both of Massachusetts). The senators’ letter does not threaten any new actions against the organizations. The Hill newspaper reported last week that the Washington, D.C., litigation firm Cohen Milstein Sellers & Cole had been hired by a group of state attorneys general on a contingency basis to try to prove in legal proceedings that Exxon Mobil “knew” fossil fuel usage caused global warming and lied about it. U.S. Virgin Islands Attorney General Claude Walker had subpoenaed Exxon Mobil and the Competitive Enterprise Institute — one of the free-market groups named in the Democrats’ campaign — seeking decades of records, but then withdrew the subpoena. Swanson questioned who was orchestrating the senators’ campaign. 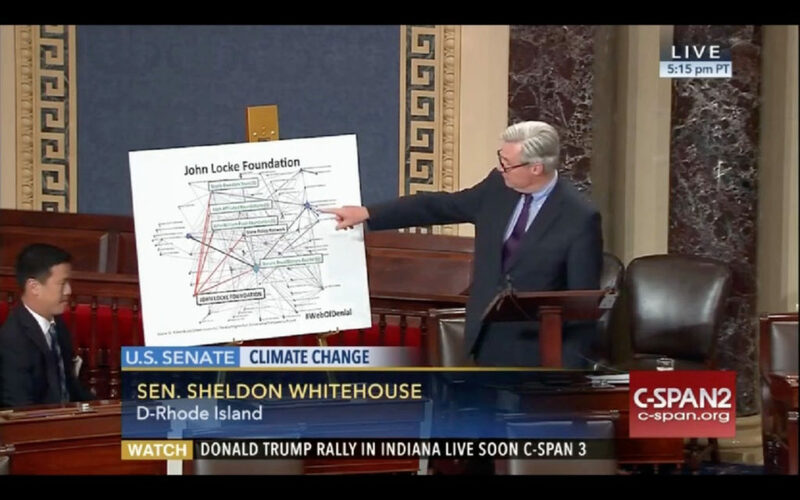 “We, too, would like to know whom we are debating, and who is leading this crusade against liberty,” Swanson said. “Once again, members of the U.S. Senate have rejected rational debate and have resorted to bullying and intimidation in their attempt to stifle the message of freedom and limited, constitutional government that has resonated with millions of North Carolinians,” Swanson added.